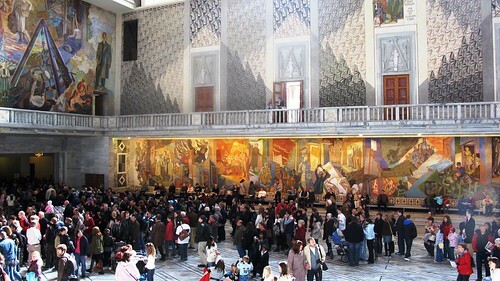 Everyone who showed up at Oslo City Hall got a free Oslo Pass for free entrance to museums, attractions and public transportation and in addition a discount on a number of restaurants and shops. 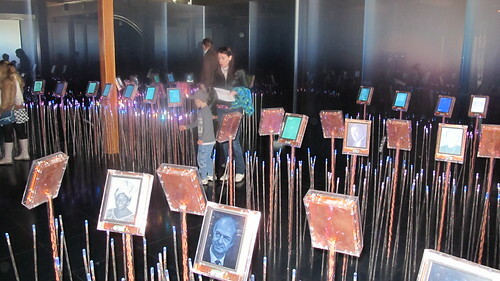 Left: The Nobel Peace Center – Right: Inside, the peace garden. 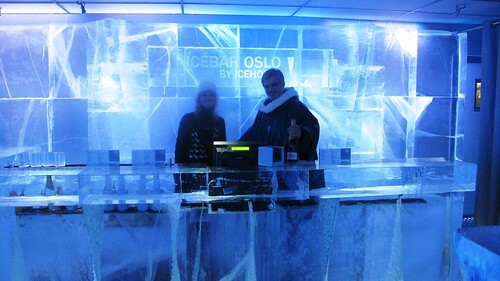 Left: Ice Bar Oslo – Right: Meeting Henrik Ibsen at the Parliament. 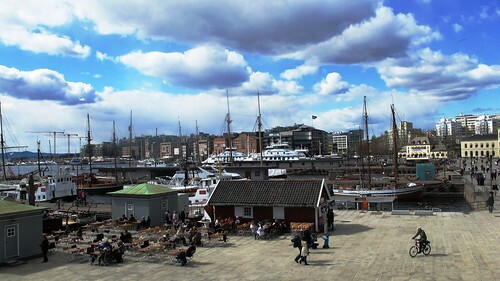 Right: Aker Warf (shopping, finance and amusement centre). 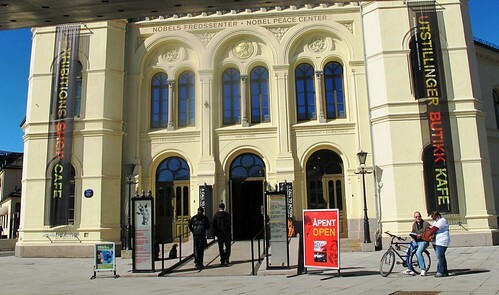 Opened in 1899, it’s a home to the dramatic Norway arts and use of the language on stage. 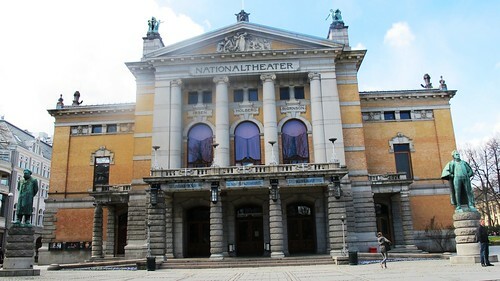 The desire to establish a theatre for Norwegian dramatists and stage artists constituted a natural part of the country’s national development and its separation from Sweden around the beginning of the last century. 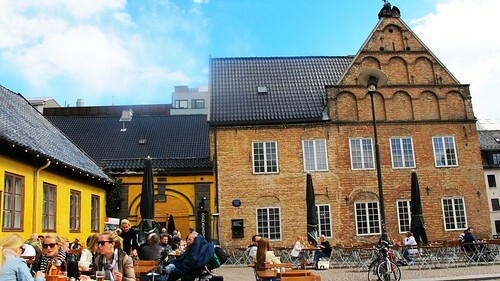 The statues of Henrik Ibsen and Bjørnstjerne Bjørnson still take a place of honour in front along with Ludvig Holberg and as you can see, they are engraved on the front of the building. This “Tourist in your own city” program gave a lot more options to Oslo’s major cultural institutions of course: A way to familiarizing with one of Europe’s leading networks of public transportation above and below ground – and on the stunningly beautiful Oslo Fjord, free entrance to all other museums, attractions as well as discount on a number of restaurants and coffee bars. However, it’s impossible to cover it all in one post. 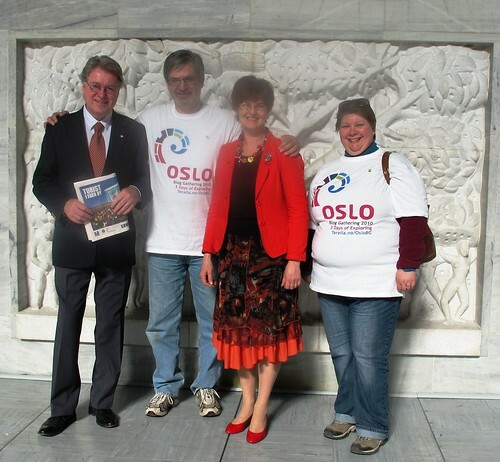 The VisitOSLO CEO told me that about 7,000 participated last year. At the Oslo Blog Gathering, the principle is the same and then you even have three days to explore the city and surroundings. Go check out the Official Program site and book the program fee (Oslo Pass is included) to join bloggers from all over the world! 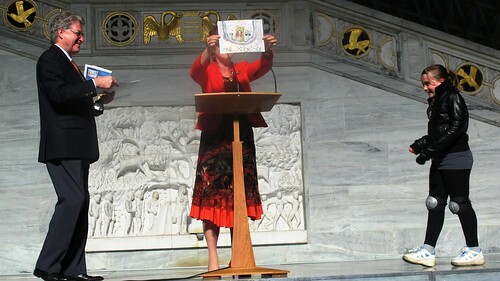 Click for my wife DianeCA’s post from today’s adventures: Always in new and other prospectives! That looks absolutely fantastic Renny, but I’m going to have to miss the Blog Gathering. I’ll send you an email explaining why. Good tour of Oslo. Nice to get know of unknown places. Oslo is a relatively small city and parking is at a premium so a car is a bit of a liability. Fortunately there is an extensive and superbly efficient public transport system involving buses, trams, subway, trains and ferries, operated by Oslo Sporveier. The city is served by 50 bus lines and eight tram routes, all starting from Jerbanetorvet at Oslo S Station. The subway is called the Oslo T Bane and there are five underground lines covering the city. 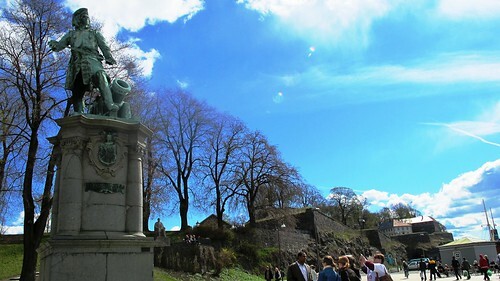 What a nice weather is now in Oslo: shinny blue sky… uau! Hello Renny! That’s nice to see this whole organization. I want a shirt. I really like to see photos of Oslo. Until May 14 was not sure if I can go. I’m looking forward. A big hug for you and Diane. As I said to Diane in her post, Pierre and me we want a t.shirt OBG 2010! I think we will have a lot to visit in august! All my work girlfriends teachers at school know now I’ll be in Oslo!!! And each time I visit you and Diane I dream and imagine all the lovely places we will discover and the good time we will have all together again! Very nice job on your post. Glad it finally got done last night ;-) It is a very good ‘teaser’ for the blog gathering. 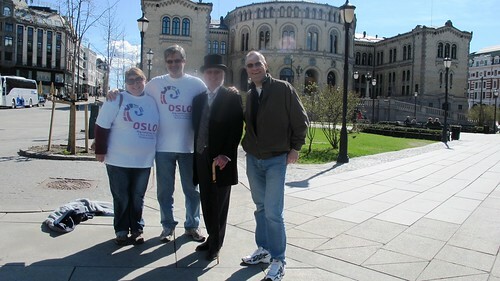 Especially with this super hot model you have posing in the Oslo Blog Gathering T-shirts! What a catch! You are a lucky man, babe! What fun! 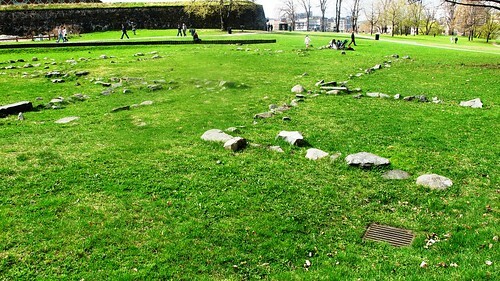 I’d love to visit Oslo again.. it was a long time ago since I was last there. Lovely pictures, Renny, especially those of you and Diane. I’m so looking forward to meeting everyone in August and having fun seeing the sights with you all. Dear friend, what a tempting event and place to be. I have tagged both yours and DianCA’s post in my last entry – from to days big weather surprise here in Oslo. btw. Ingelin, Leander and Sölvi came safe and sound to Düsseldorf, after a dramatic driving, due to both Railway and Roadtunnels were closed last weekend. oh ! i like osho Picture , i think this is my dream city..
That is an awesome way to get people to use and understand public transportation along with getting the community back into the cultural arts and local venues. If you think about it, when family or friends come into town these people who took advantage of this opportunity will most likely take them out to do the same and show them their town. More towns should do this. Like I told Diane when I read her post (she was faster than you this time! ), I believe it’s a great idea. We should all see our cities as tourists from time to time… it’s a great way to appreciate the beauty of cities. I’m really looking forward to see you and all the sights again!!! It feels great to have something after our summer paradise time to look forward to! One of these days you will think about a change in your career: you are very good in this event organisation field (I am impressed). You can be very proud of your city (and country), Renny. You are one of its biggest ambassadors! Pingback: So what do you think of the newest news out of Oslo? I will get over there one of these days.